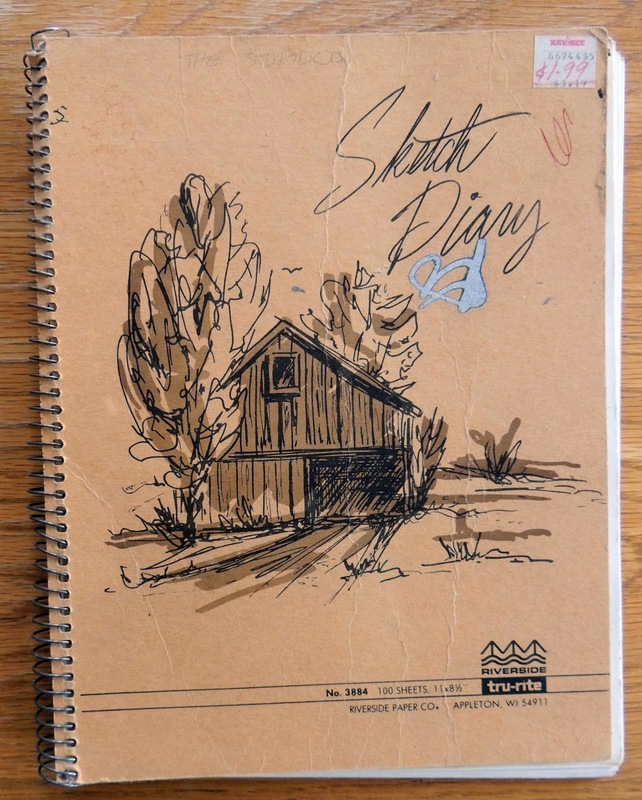 Wrapping up the last few pages of the Kay-Bee sketchbook, pages 20-22, we first see a rough sketch of Casey's grandmother's farmhouse and barn. 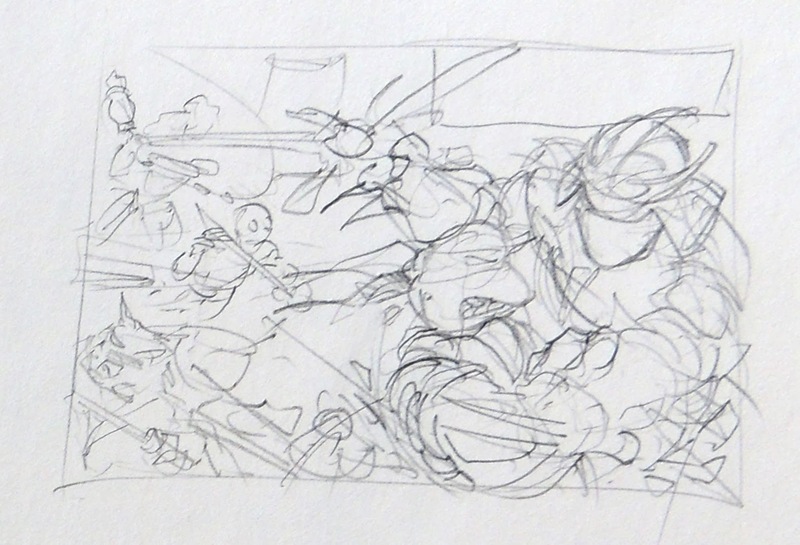 I think I did this to work out how it would look on the last page of the story in issue #12 of TMNT Volume One. 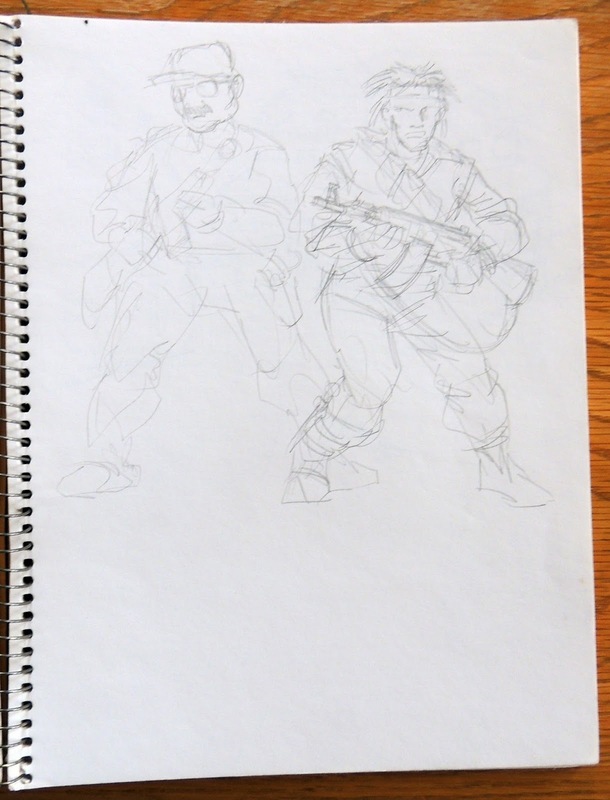 On the following page, there is another rough sketch of two of the members of the survivalist group from that same issue. 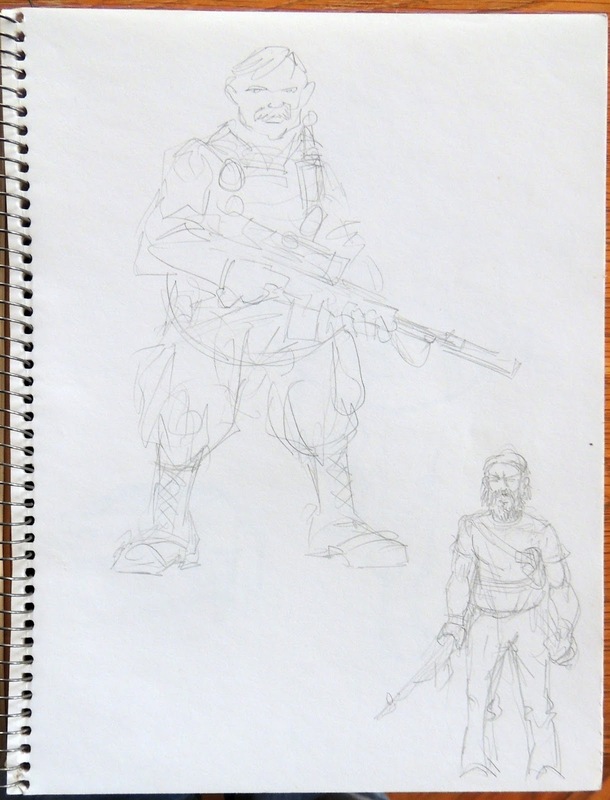 On page 18 of the Kay-Bee sketchbook is a concept drawing for the character of Skonk, leader of the survivalist group in issue #12 of the first volume of TNT comics. 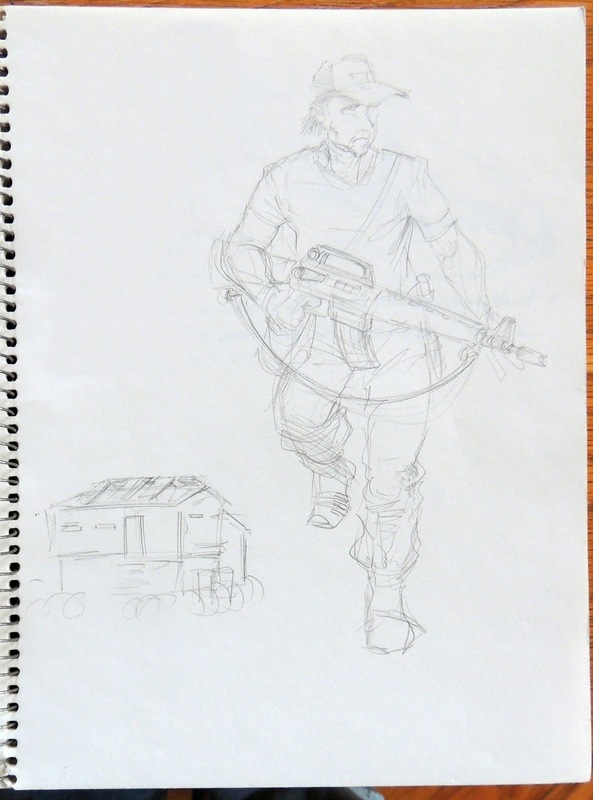 I drew him here posed with his foot on the homemade nuclear weapon he and his group had concocted, but in the actual comic that device was at least twice as large as it appears here. A few weeks ago, I got a call from my pal Steve Lavigne. 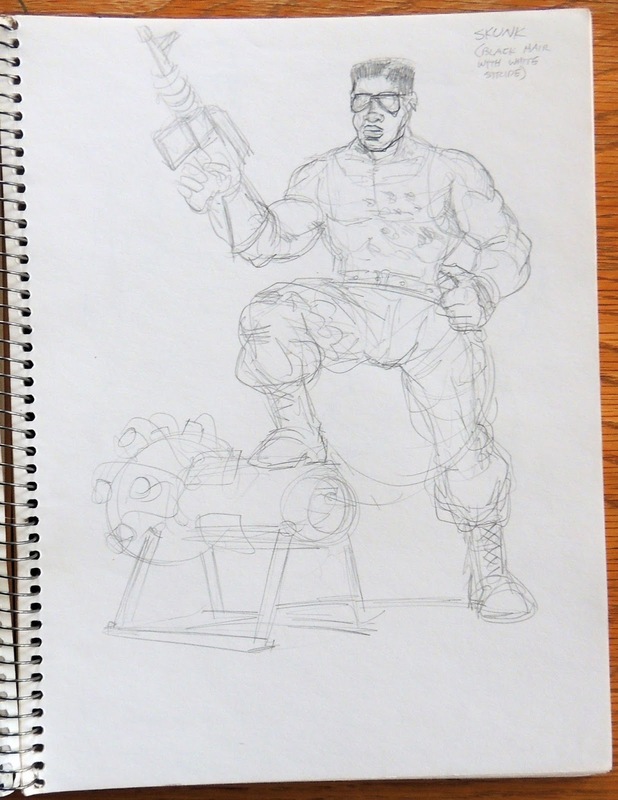 He asked me if I would be interested in inking a cover he was penciling for IDW, for a reprint of some old Archie TMNT comics stories, I think. Having had fun last year inking a couple of his drawings, I said I would. … which I printed out on a piece of 11 by 17 inch card stock, and got to inking. I was planning to do it all with brush and ink, but realized pretty quickly that my somewhat rusty inking skills were not quite up to handling the level of fine detail in the drawing in that fashion, so after doing a little bit -- mostly the foreground figures -- with brush, I switched over to a variety of brush markers. That was a lot more in my "comfort zone". 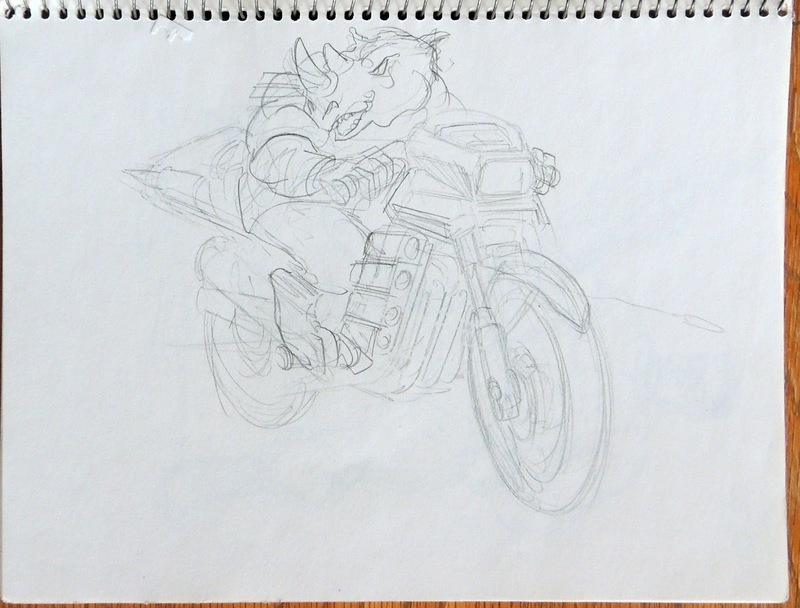 While there are no notes on this page, I have to think that this drawing of a rhino mutant (Rocksteady?) 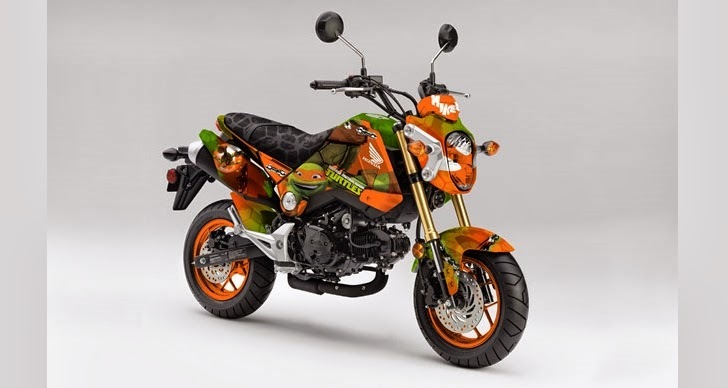 riding a motorcycle was an idea I intended to send to Playmates Toys, as a suggestion for expanding the TMNT toy line. 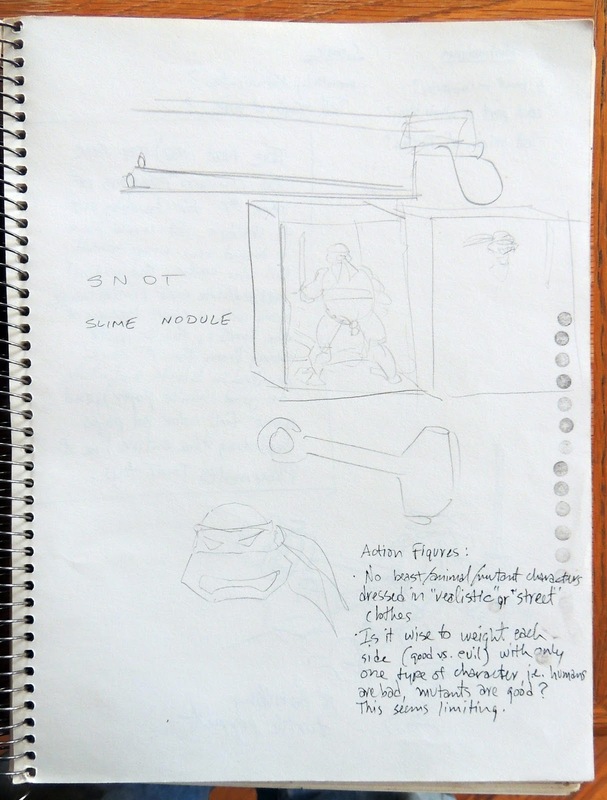 On the next three pages of the Kay-Bee sketchbook, I made a bunch of notes about the story Kevin and I were working on for issue #11 of the TMNT Volume One comics. This is the follow-up to issue #10, wherein the Shredder came back from the dead, and he and the Foot invaded April's apartment building, which caught fire during their pitched battle. 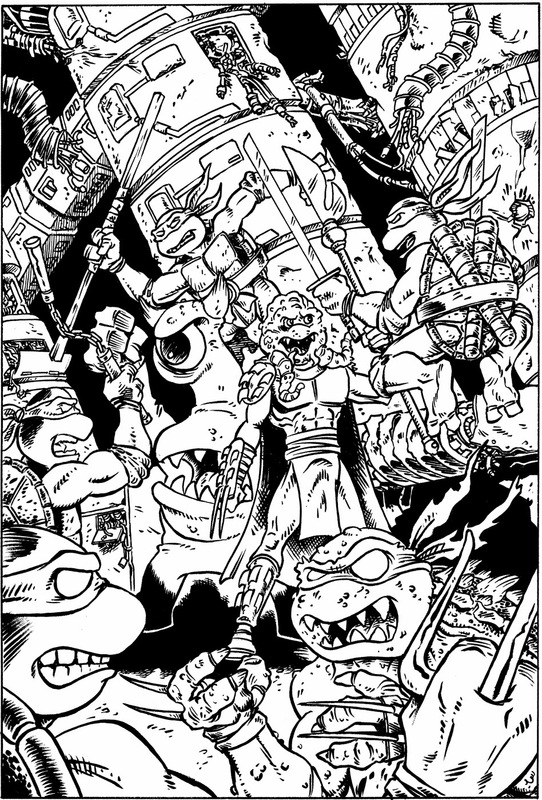 Casey Jones had appeared at a crucial point in the struggle, fighting on the Turtles' side and helping them, April and Splinter to escape the city. 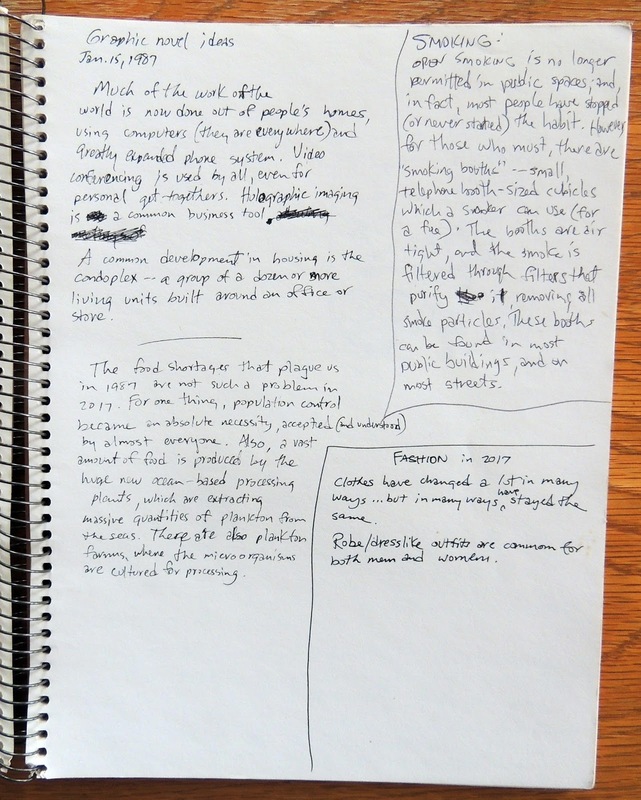 Again, I''ve transcribed the notes to make them easier to read. 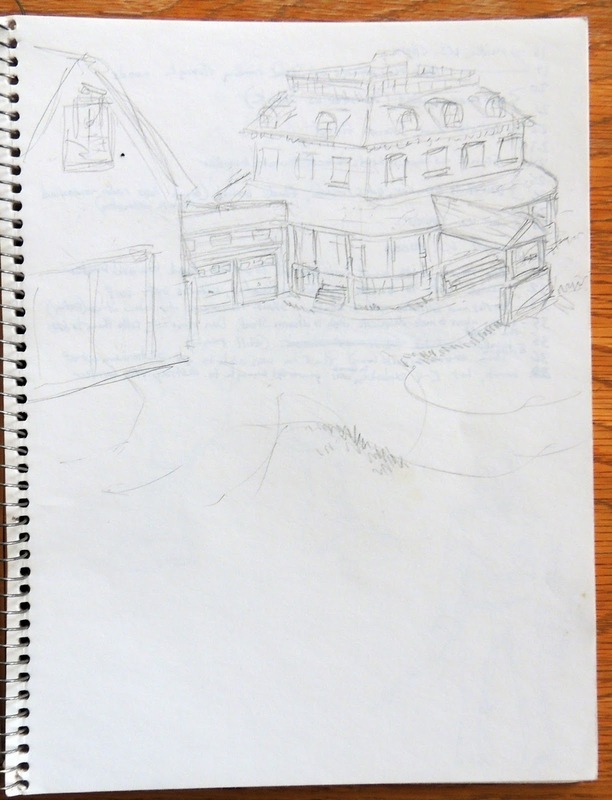 For April: Her building burned down, taking with it all of her worldly possessions… and nearly twenty years of memories. She left in terror of her life, with only the clothes on her back, in the company of four Turtles, a giant rat, and a somewhat disturbed man in a hockey mask. April's "normal" life has vanished forever. She had an inkling of this fate when she first hooked up with the Mutant Turtles… but now she is involved int heir lives. Their fate has become inextricably connected to hers. Before the Shredder and his ninja attacked her home, she hadn't fully realized or accepted the fact that with the friendship and love offered to her by the Turtles and Splinter, there also came deadly danger. Along with personal fear comes resentment… of the Turtles for exposing her to this danger… for setting in motion events that have destroyed the elements of her everyday life. She knows they didn't want it to happen… but it did. IN the back of her mind, though, she knows that part of the responsibility is hers -- she accepted them into her life… and her apartment. But the predominant feeling is anger. 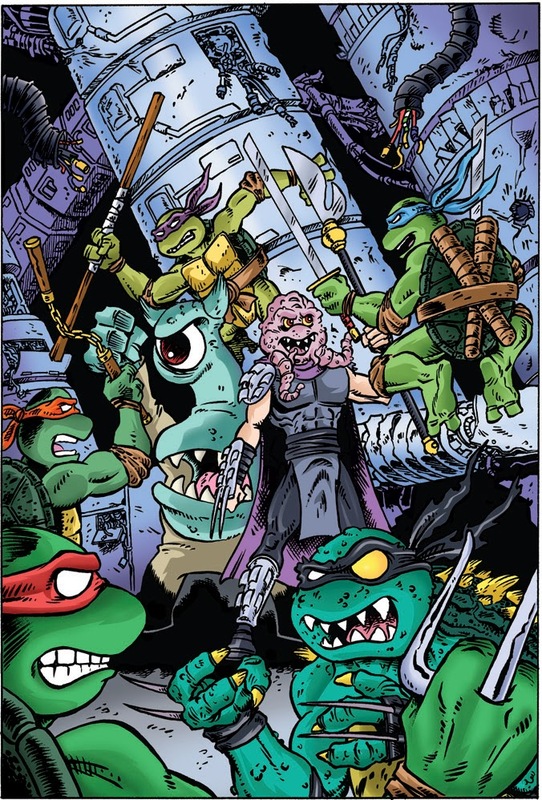 For the Turtles: The Shredder's attack was a shocking blow in several ways. First, it made the Turtles feel vulnerable. It made them feel like they couldn't protect themselves, let alone April. Secondly, they feel guilty that they've screwed things up for April… perhaps permanently. They've exposed her to a threat which could follow her for the rest of her life… and has already eradicated, destroyed most of the material aspects of her life. Leo: Leonardo especially feels depressed and guilty. In addition to feeling guilty about not being able to hold up his end during the big fight in #10, he feels that he has failed as an individual by not being able to defend himself successfully against the Shredder and the Foot in the Leonardo micro-series. This is ridiculous, of course -- he was vastly outnumbered -- but he still feels it. (Leo has unrealistic expectations of himself.)" April is in a state of flux. She's unsure of what to do… get a job? Because of the savage attack of the Shredder, she's somewhat gun-shy about exposing herself, living in public… even though the likelihood of the same thing happening here in Northampton is slim. Living out in the woods, in a farmhouse, is also pretty strange for April, who has been used to living in the "Big Apple". The relative isolation of this area may bother her… although the clean air and lower noise level is refreshing. The Turtles are, in all situations, adaptable. It's part of their nature and training. They know they've suffered a severe setback, a defeat… and that has its effects. To some degree, they are demoralized. But they are also open to enjoying and using the benefits of their new situation. And this is new to them… like April, they were mostly accustomed to the landscape of the city. Some of the Turtles like this locale better than the others (Don, for example). Casey lives from moment to moment. He's not one to make lots of future plans. He probably will get a job to help support his new "family". 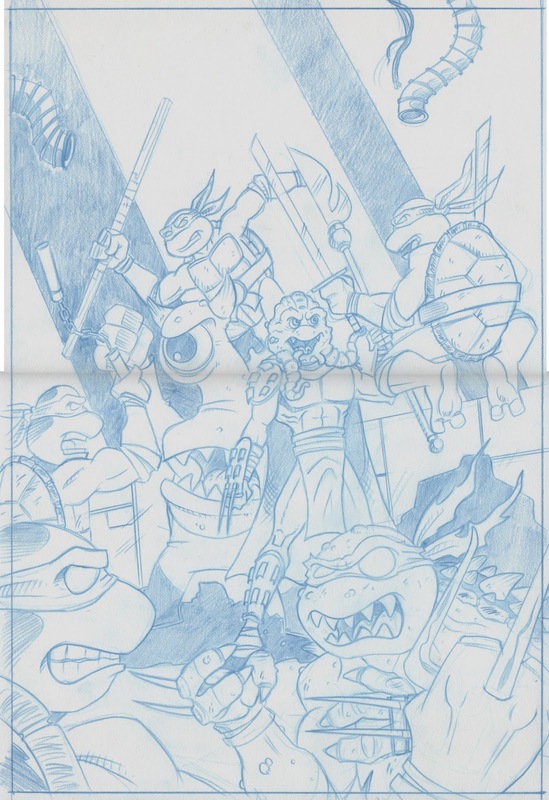 (Incidentally, while Raphael and Casey are buddies, the other Turtles and Splinter are still somewhat ambivalent about Casey. They cab see that he wants to be friends, and he did help them out… but he is also obviously nutty. So they are a little cautious in fully accepting him so soon." 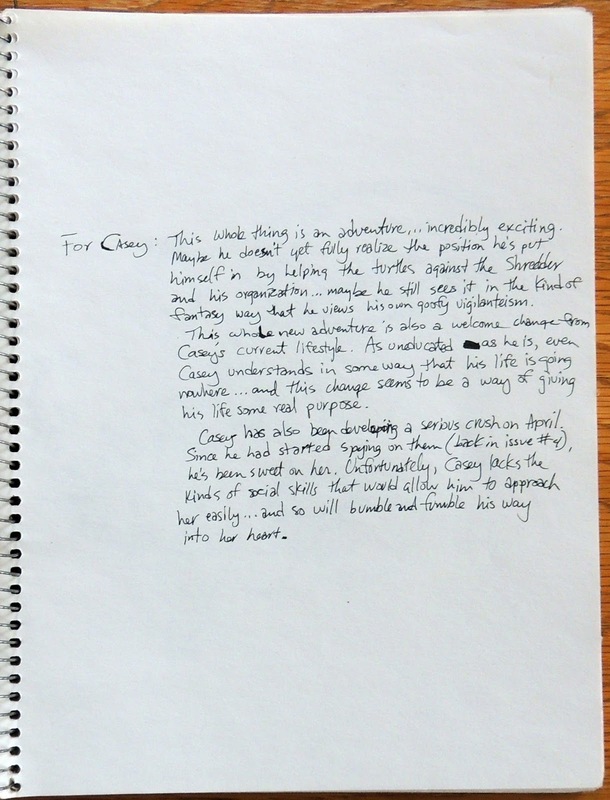 "For Casey: This whole thing is an adventure… incredibly exciting. Maybe he doesn't yet fully realize the position he's put himself in by helping the Turtles against the Shredder and his organization… maybe he still sees it in the kind of fantasy way that he views his own goofy vigilanteism. This whole new adventure is also a welcome change from Casey's current lifestyle. As uneducated as he is, even Casey understands in some way that his life is going nowhere… and this change seems to be a way of giving his life some real purpose. Casey has also been developing a serious crush on April. Since he had started spying on them (back in issue #4), he's been sweet on her. Unfortunately, Casey lacks the kinds of social skills that would allow him to approach her easily… and so will bumble and fumble his way into her heart." "Casey has also been developing a serious crush on April. Since he had started spying on them (back in issue #4), he's been sweet on her." I have to say that I never had a conclusive answer to the question, because it had been so long that I'd forgotten what our intentions were! I seem to remember suggesting at one point that it might have been some agent of the Foot Clan. 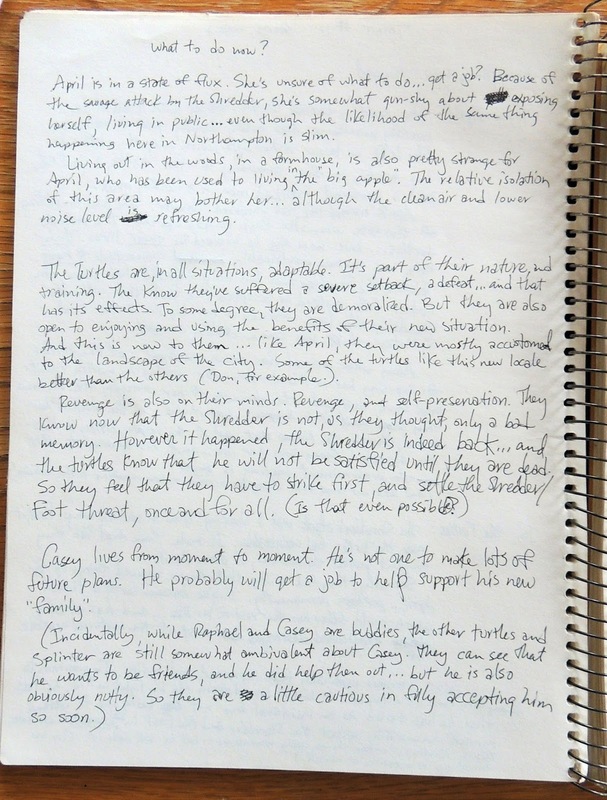 But if these notes, very likely written in 1987, and thus much closer in time (and memory) to our work on issue #4, are accurate, we'd originally intended that mysterious person to be none other than Casey Jones. 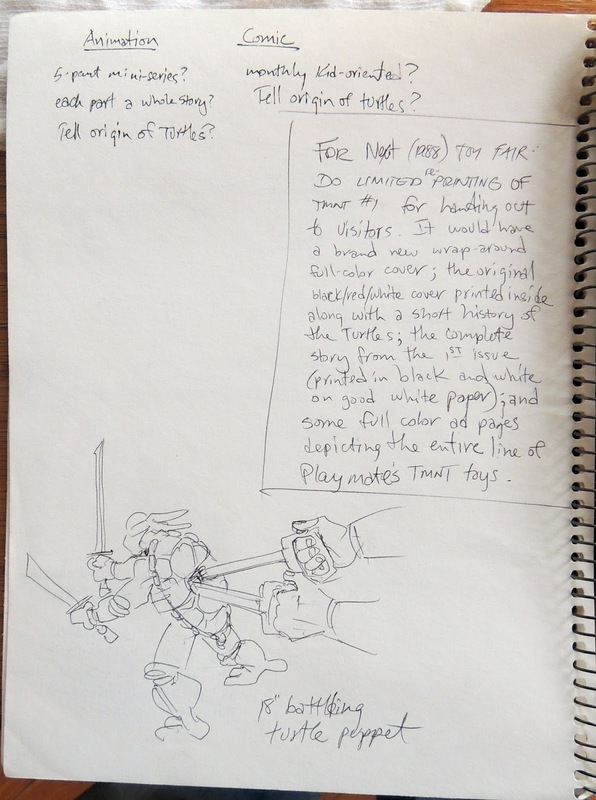 On pages 12 and 13 of this Kay-Bee sketchbook, I wrote down some notes on my idea for issue #12 of the Volume One TMNT comics. It was the first issue I'd worked on without Kevin Eastman's involvement, when we were taking a break from working with each other. Group (6?) of fanatic, lunatic-fringe survivalists living in hill-town want to survive the coming nuclear holocaust… but they can't wait, and decided to try to start it themselves: They build a homemade nuclear bomb and pan to plant it in the United Nations building, hoping that it will start a nuclear exchange between the US and Russia. To build the bomb, they have kidnapped a UMass physics student to help them… and somehow have obtained enough plutonium (stole it from a nuke plant? maybe one of them used to work with nuke weapons in a storage facility, like in THe Technician, where security was lax) to make the bomb work. 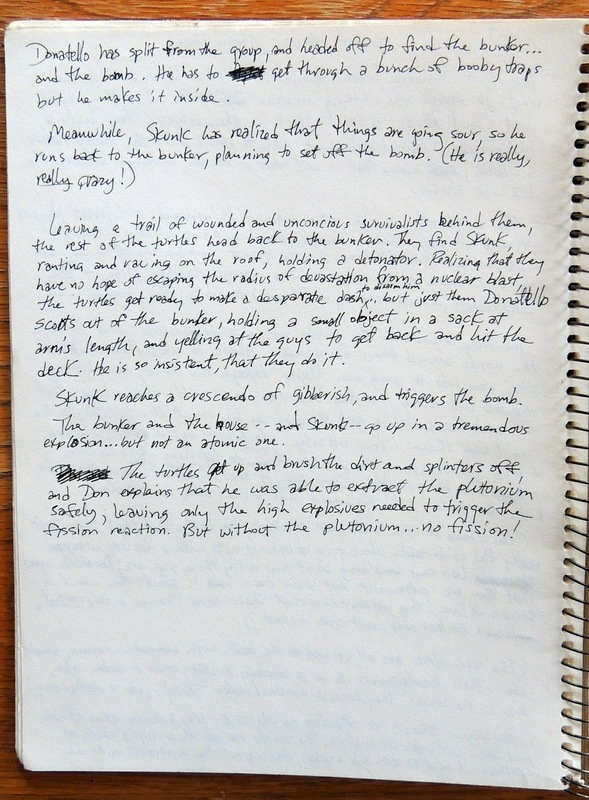 The story begins with the Turtles out on an exploratory jaunt through the woods around their farmhouse. About 10 miles from the house, they run into a young man fleeing through the woods, his clothing tattered and dirty, his face unshaven, eyes wild. His glasses fall off and accidentally get stepped on by one of the Turtles, so he can't see them very clearly. 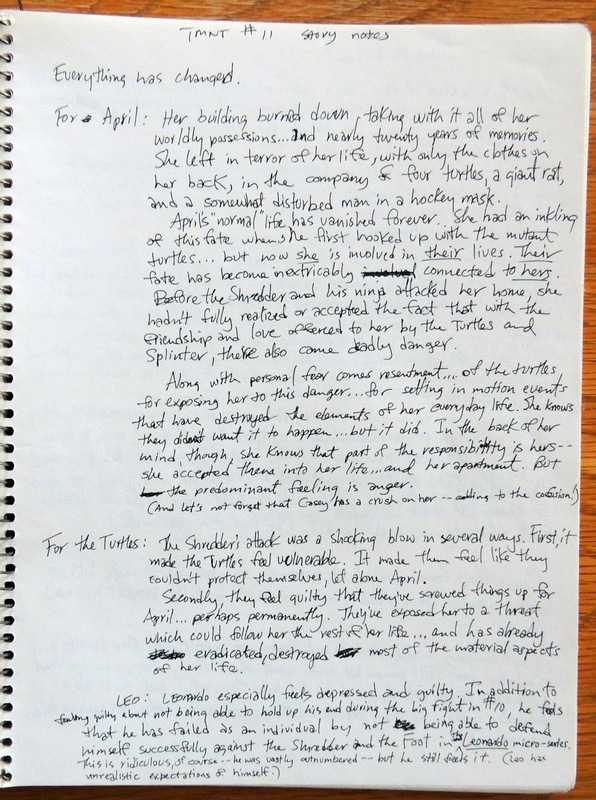 He blurts out a quick synopsis of the above story, and asked the Turtles to let him go so he can escape form his pursuers. Just then a shot from a sniper rifle rings out, wounding the kid. The Turtles bind his wound and hide him and set out after his assailant. Anyway… there's lots of action as the Turtles play a deadly game of hide and seek with the survivalists. The Turtles use all their ninja skills of concealment and stealth and surprise, taking out the survivalists one by one. Donatello has split from the group and headed off to find the bunker… and the bomb. He has to get through a bunch of booby traps but he makes it inside. Leaving a trail of wounded and unconscious survivalists behind them, the rest of the Turtles had back to the bunker. They find Skunk, ranting and raving on the roof, holding a detonator. 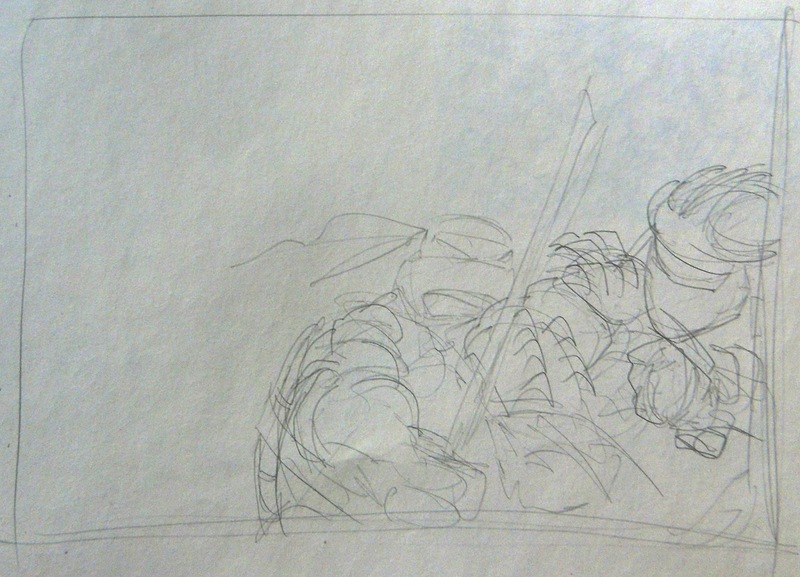 Realizing that they have no hope of escaping the radius of devastation from a nuclear blast, the Turtles get ready to make a desperate dash to disarm him… but just then Donatello scoots out of the bunker, holding a small object in a sack at arm's length, and yelling at the guys to get back and hit the dirt. He is so insistent, that they do it. Skunk reaches a crescendo of gibberish, and triggers the bomb. The bunker and the house -- and Skunk -- go up in a tremendous explosion -- but not an atomic one. 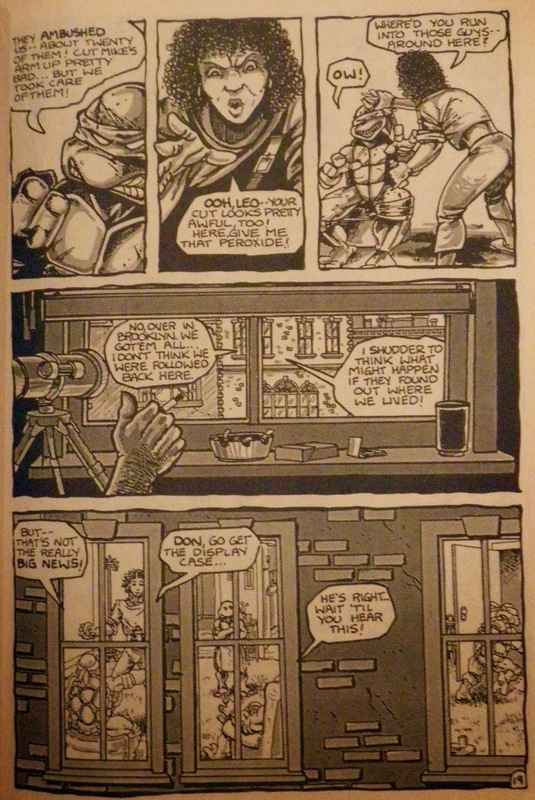 The Turtles get up and brush the dirt and splinters off, and Don explains that he was able to extract the plutonium safely, leaving only the high explosives needed to trigger the fission reaction. But without the plutonium… no fission!" 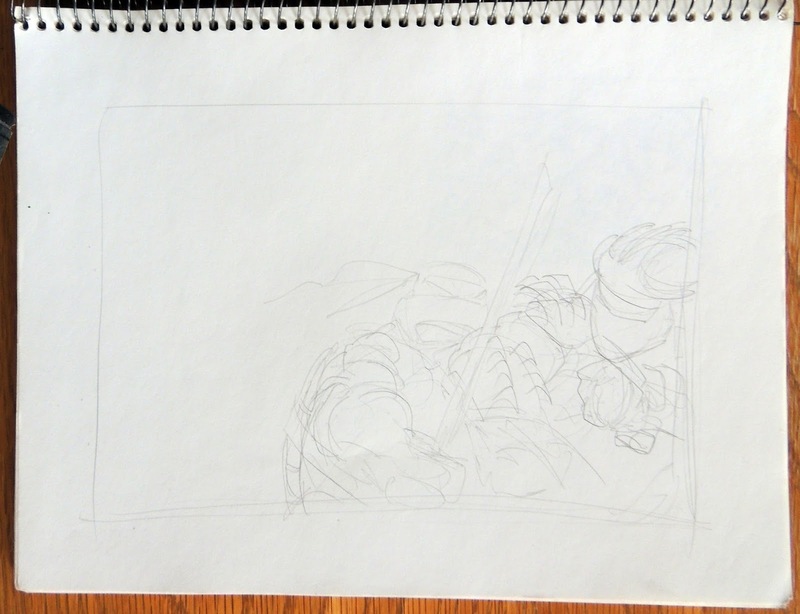 Moving on to pages 7 and 8 of the Kay-Bee sketchbook, we have two rough "thumbnail" drawings of what I am pretty sure was to be the cover for TMNT Volume One issue 10. 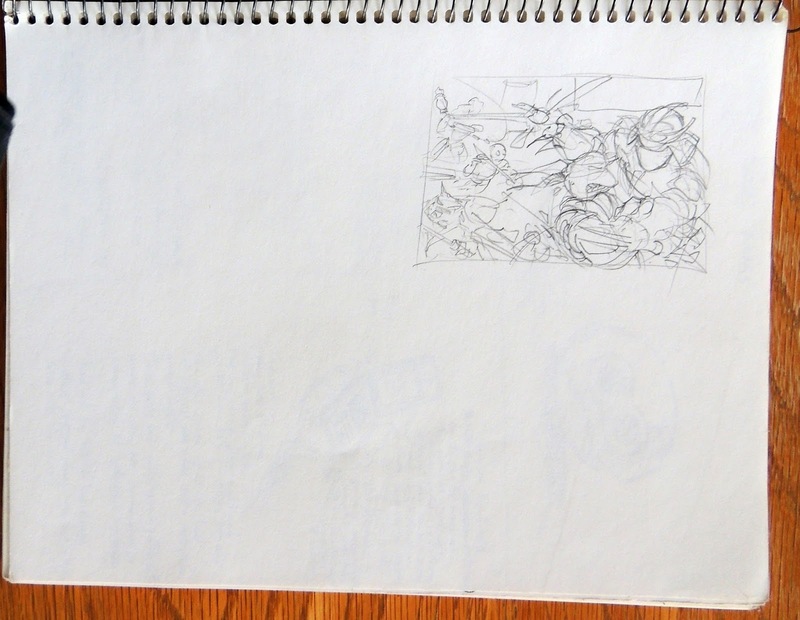 Sorry that the image on this page is difficult to see -- I drew it quite lightly. Here's a cropped version of the above, tweaked a bit in Photoshop to make it slightly more legible. 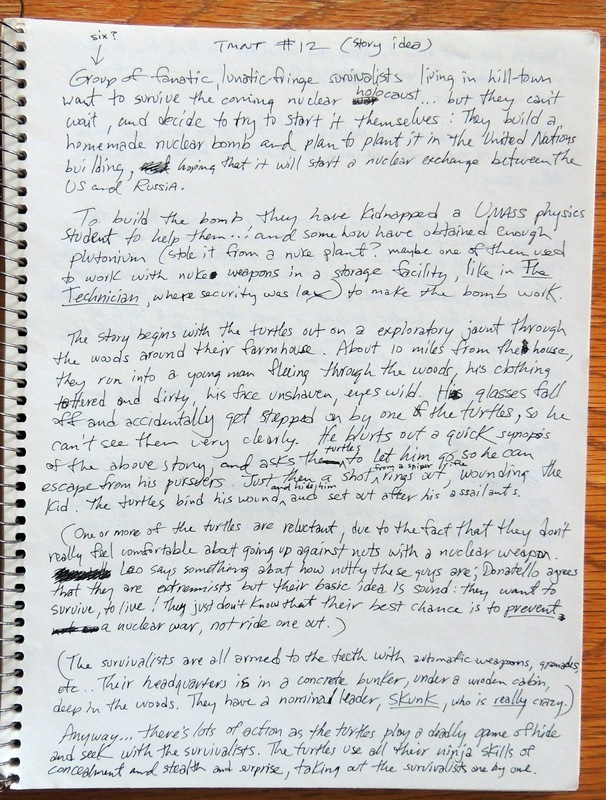 More interesting to me are the following preliminary "world building" notes on page 9 of the sketchbook which deal with the planned (but never produced) TMNT graphic novel set twenty years in the future (at the time these notes were written, that meant 2017) Kevin and I had discussed, especially the bits about the "videophone" of that future. In the year 2017, many things are different than they are now in 1987. Fusion power: Small fusion generators power trains, large trucks, planes, ships… also supply power to most buildings, giving people more reliable, independent energy. All telephone lines, power lines, and the attendant poles, etc. are gone. All the cables, etc. are now underground. Most private autos are small, electrically powered… and guided automatically along streets by hidden sensor units. The bulk of the population uses an extensive and highly efficient, very flexible mass-transit system. 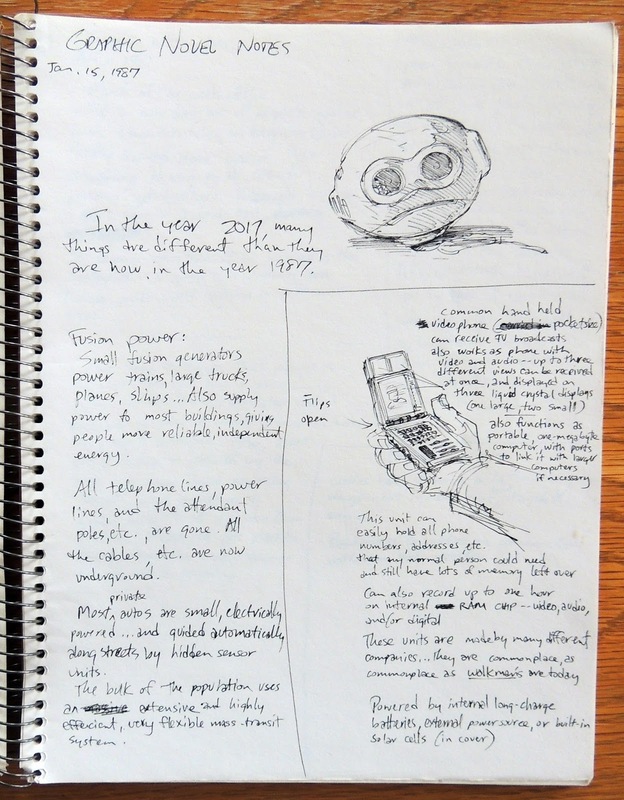 Powered by internal long-charge batteries, external power source, or built-in solar cells (in cover)"
Here on page 4 of the Kay-Bee sketchbook, I was apparently trying to sketch out some kind of TMNT toy accessory, and it appears it had something to do with ooze. 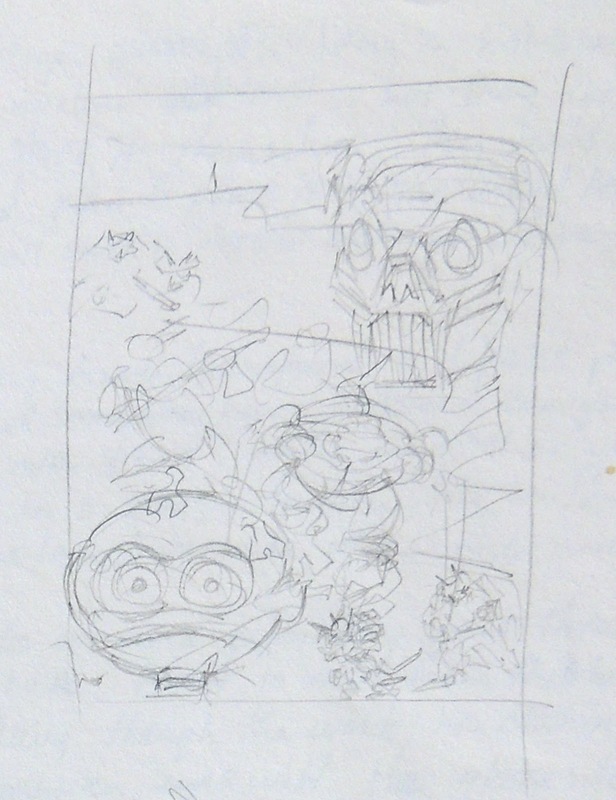 I can't remember exactly what a "slime nodule" was supposed to do, but it looks like it might have involved a clear plastic cage into which a figure (in this rough sketch, a Turtle) could be put, and then have slime or ooze poured on top of it. Is it wise to weight each side (good vs. evil) with only one type of characters, i.e. human are bad, mutants are food? This seems limiting." each part tell a whole story? 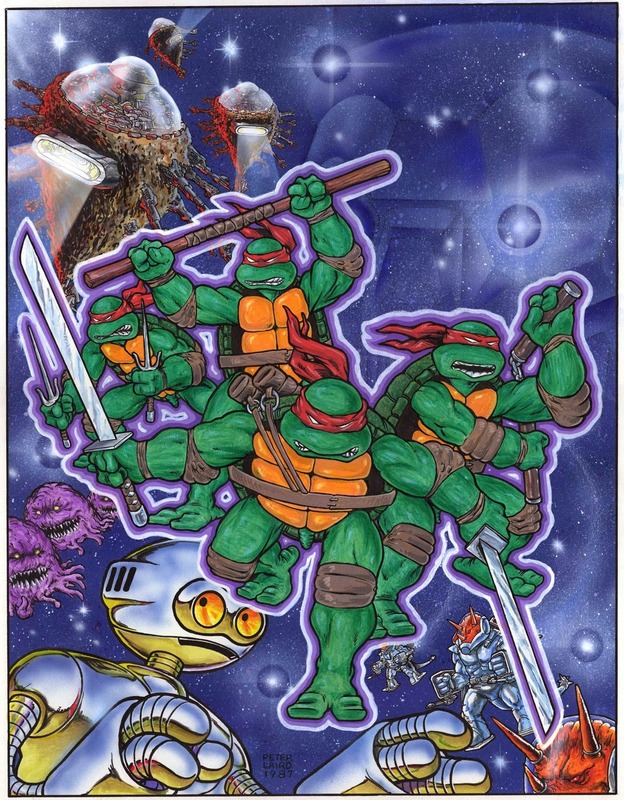 I have to say I like the idea of the large battling TMNT figure, controlled via some kind of rods which would allow a sort of remote control kind of operation. I guess Playmates didn't like it as much as I did. 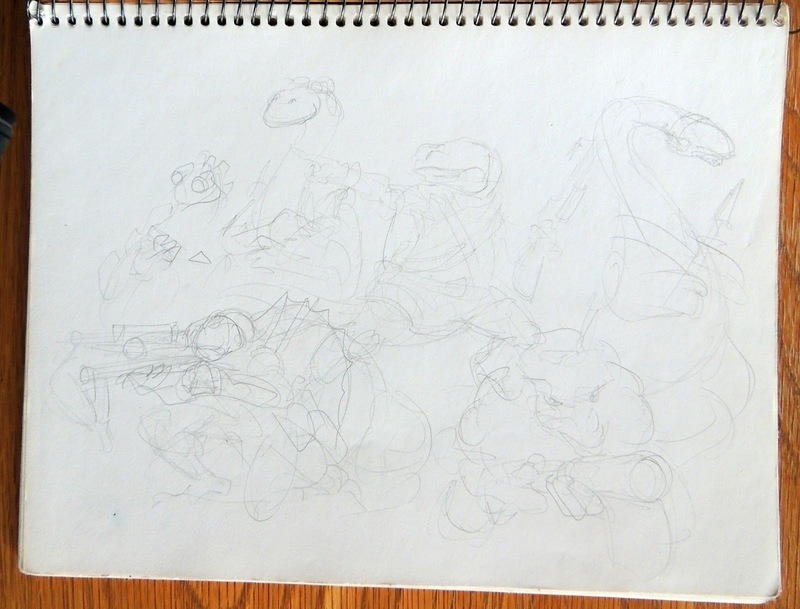 Poking around in my studio a couple of days ago, I ran across a small stack of old sketchbooks. These were a common sight around the studio in the mid to late 1980's, with their yellow/brown covers and spiral bindings. I remember that I used to buy these quite inexpensively (the marked-down price on this one, as you can see, was just $1.99 -- not bad for a 100-page sketchbook with pretty decent paper) at the various Kay-Bee toy stores which could be found in a number of western Massachusetts towns, often in malls like the Hampshire Mall close by to us in Hadley, the Ingleside Mall in Holyoke, and a shopping center out in Dalton. 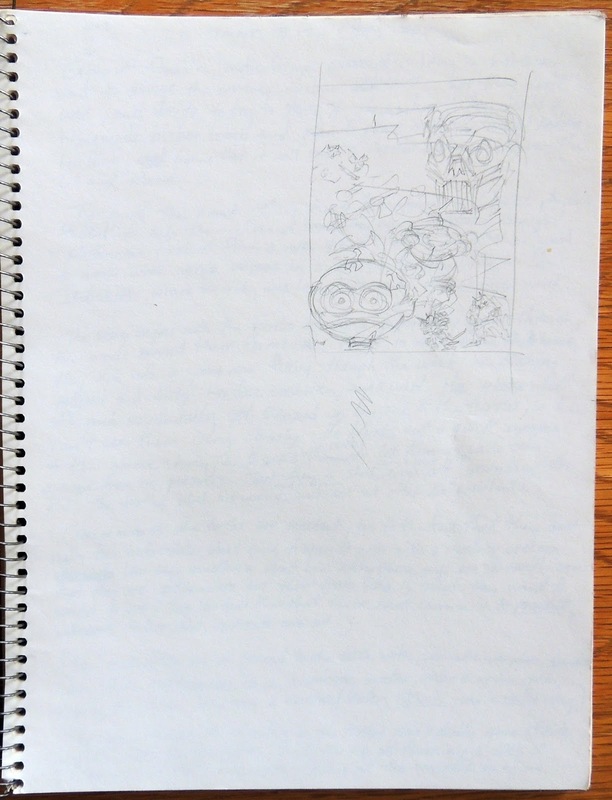 Several pages were given over to handwritten story notes related to issues 11 and 12 of TMNT Volume 1, as well as a graphic novel idea -- or at least some musings about the setting for the graphic novel -- that Kevin and I had discussed but never got around to actually creating. 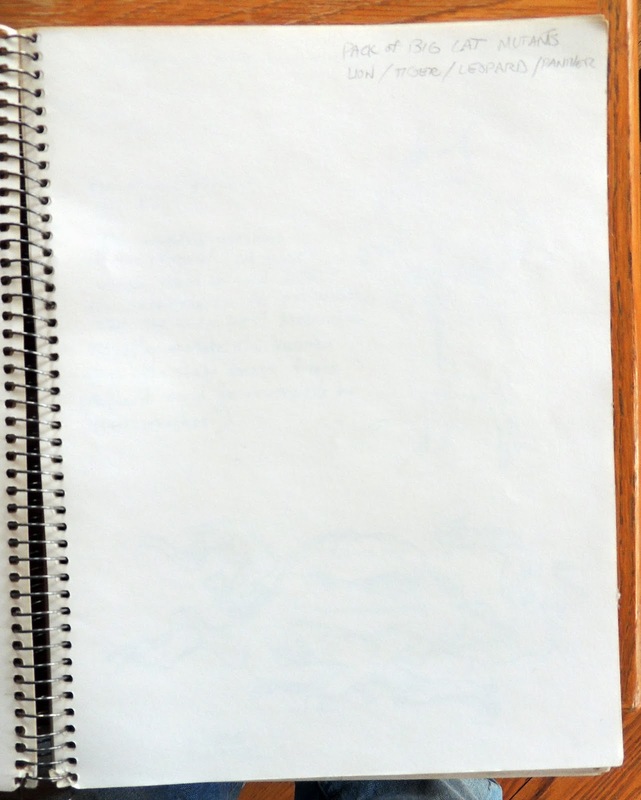 I've transcribed these notes as best I could so that it will make them easier to read. 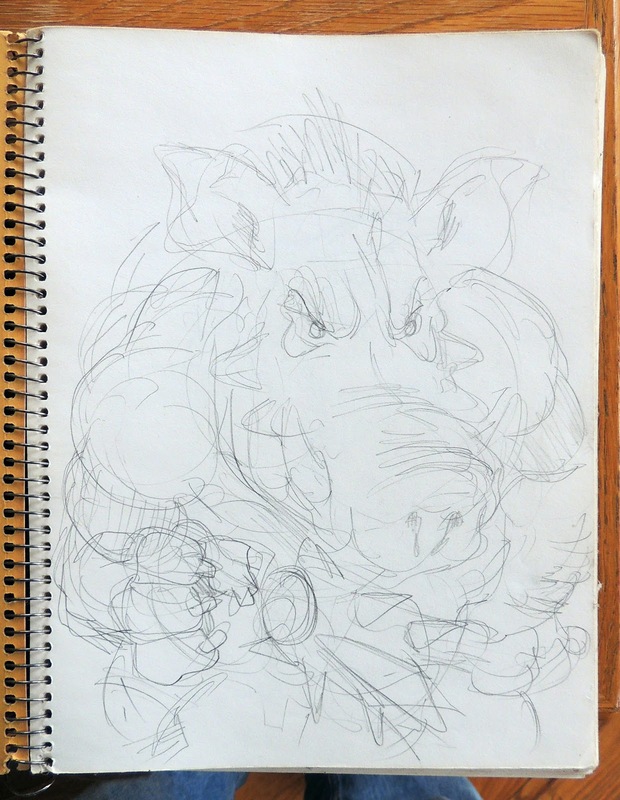 This first page has a loose pencil sketch of what appears to be a mutant warthog, wielding a spiked club. Was this an early design for the character Bebop from the first animated series? I'm not sure. Clearly, this was a thought I had for what I considered would be a fun group of animal mutants. I still like it. 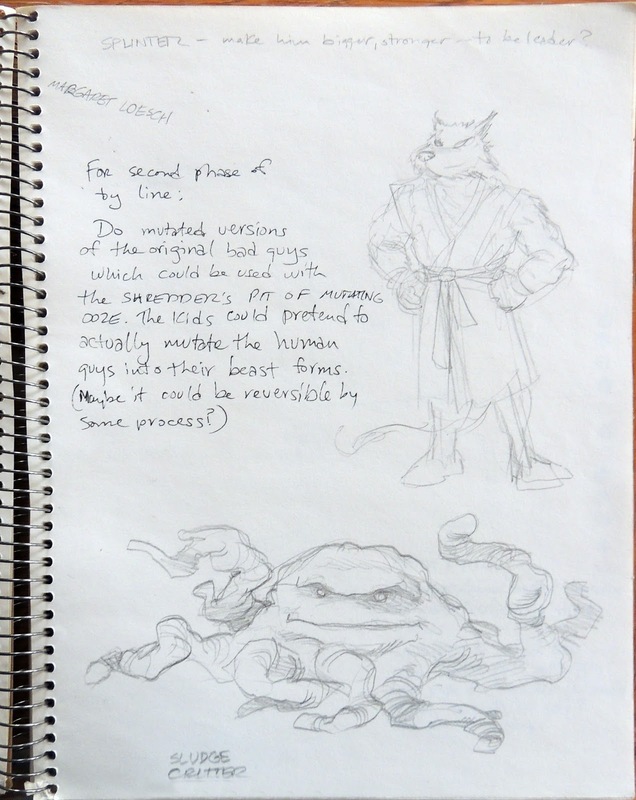 A group of four big cat mutants could be a cool set of adversaries for the four Turtles. "Splinter - make him bigger, stronger -- to be leader?" And just kind of hanging out there in the breeze is the name of Margaret Loesch, who -- if I am remembering properly --- was a TV executive that we (or, more accurately, Gary) dealt with back in the early days. I'm not sure why I wrote her name down here. Do mutated versions of the original bad guys which could be used with the Shredder's pit of mutating ooze. The kids could pretend to actually mutate the human guys into their beast forms. (Maybe it could be reversible by some process?)" 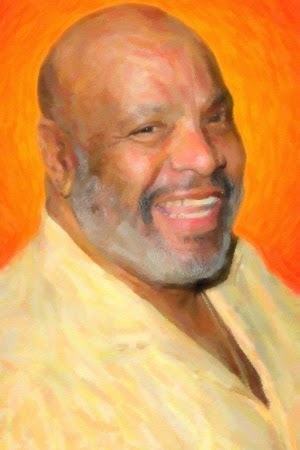 Coming home today, listening to NPR, I heard that actor James Avery had passed away. As most TMNT fans know, one of Avery's notable voice-acting jobs was ably providing the voice of the Shredder in the first TMNT animated series.